Clenbutaxyl – a drug that is used for medical purposes for the treatment of asthma. Athletes use Clenbutaxyl as a fat burner, as well as anti-catabolic. 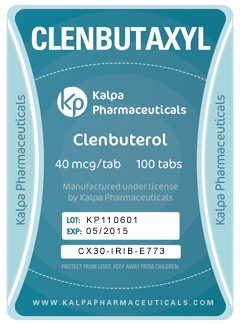 Clenbutaxyl is not a hormonal drug, and refers to beta-2 agonists. Fat burning process takes place through the action of Clenbutaxyl on beta-2 receptors of which there is the excitement of the sympathetic nervous system and starts fat burning process. While working on the beta-2 receptors, are triggered chemical processes accelerate the production of adenosine. Adenosine, in turn, triggers enzymes that trigger fat burning process by accelerating the metabolism of 30% of the normal exchange of substances. Also Clenbutaxyl blocks the formation of new fat, and when you use it, not even a diet, body fat percentage will not increase. Clenbutaxyl, in addition to fat burning action, also has a good anti-catabolic effect and helps to maintain muscle mass from destruction on a low calorie diet. In simple terms, if you are over the winter to gain muscle mass and percentage of body fat for beach season you do not like, even to the beach level in life better than fat does not burn, and as it will lose a large part of the gain muscle mass. Application at this stage of Clenbutaxyl helps burn fat faster and maintain muscle mass is also not completely, but much better than you’ll just try to keep the muscles in the amino acids and proteins. For a full conservation of muscles is better to add to the Clenbutaxyl any type of soft steroid: Oxandroxyl, Stanoxyl, Primoxyl 100, Boldaxyl, Turanaxyl. There is a rule that if steroids for muscle amateur bodybuilding course necessary, but not as much as in the drying. Because even without steroids can gain more weight, but with a lot of fat. But if you are out of this to gain weight you want to leave the muscle and the fat is removed, the steroids should be used to come to the original form. 1. Men use Clenbutaxyl at a dose of 80-120 mcg per day. 2. Women use Clenbutaxyl at a dosage of 40-80 mcg per day. Clenbutaxyl is not recommended for more than 14 days, as the body gets used to the drug and the efficiency decreases significantly. It is recommended to make a break of 14 days and receive alternate and rest for a couple of months. Of course, such dosage regimen is not as effective and convenient than using Clenbutaxyl without interruption. 1) Tremor (trembling hand) – is observed in the first days of receiving by the majority of athletes using the drug gradually decreases or disappears after a few days of treatment. Ketotifen help to reduce this effect. 3) Reduces muscle – also very common side effect, but usually only in the first days of admission. 4) The rest of the side effects such as insomnia, sweating, increased heart rate, increased blood pressure, nausea, occur less often and less pronounced, if you follow the recommended dosage, including not taking Clenbutaxyl before bedtime. These side effects also occur, as a rule only in the first days of receiving Clenbutaxyl.